Recently I was approached by “LINE Webtoon” about helping to get the word out about their “CHALLENGE LEAGUE” contest. I’m currently producing some fun exclusive comics for them to encourage cartoonists to enter their contest…. DJ!!! WHAT ARE YOU DOING!!!??! A COMIC CHALLENGE!!?! Didn’t you learn your lesson the first time around? At first glance, I was pretty skeptical as I saw their twitter feed had sent the same message to a bunch of my colleagues in comics. AND I happen to know a thing or two about “contests” and the controversies in the past in the U.S. Market. Honestly, I kind of just ignored it at first because I was very busy and it looked like a “manga”style type thing to me when I took a quick look. About a week later Ally comes into my office and says that one of her favorite creators, Nick Seluk (the guy who does Awkward Yeti and Heart & Brain) is on this new site called webtoons.com and there was a contest there to win $30,000 and she suggested maybe we put up one of our new comic ideas on there, etc….Being that the universe decided to bring this SAME thing to me in two very different ways, (and someone who doesn’t really believe in “coincidences” like this) I decided I should take a closer look and find out what this was all about before discounting it…. and I was pleasantly surprised. First up, I wanted to know the RULES. What are they wanting to do here? Who’s behind this? Is this an IP grab like past comic contests? It doesn’t appear to be any of those things. And in the USA “Webtoons” sounds like it should be animated, so I think many regular comic artists just don’t even bother to click. Webtoons = Webcomics. Ideally the kind you scroll down to read. The main goal is for LINE Webtoon to expand what they’ve already been doing on the other side of the planet and expand into the United States comic market and diversify the styles of comics. You own all of your content. Webtoon DOES seem to select key creators and offer them a deal of some kind but it’s not for ownership, more like splitting of ad costs or having the creators design integrated ads for the most popular features. Here are some facts I’ve gathered in my own research (and links) for you to judge yourself and learn more about this. I find it fascinating that this GIANT COMICS SITE exists over there, more popular than any in the USA and seemingly nobody in the USA comic market has heard of it. I think partly because it’s called “Webtoons” which sounds like animation to most comic artists I know. But… WEBTOON = WEBCOMIC. 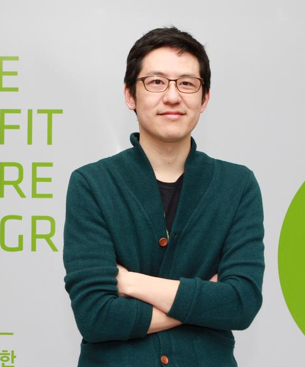 Factoid #1 : JunKoo Kim, the director and head of the LINE Webtoon Division for Naver was named #2 “Next Gen Innovator 2014” by Forbes Magazine. Read the article here. I found this pretty interesting. #2 “Webtoons’ growth is similar to Google’s development… LINK TO ARTICLE HERE — Long story short, NAVER is like the Google of Korea, and they are investing in WEBCOMICS as a platform just Google did for BLOGS and created the “Blogger” revolution (38 Million blogs as of 2006!) – Essentially they feel Webcomics can be a big platform like YOUTUBE or Blogs….. and over there, they are right! 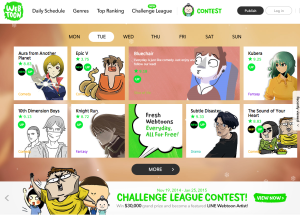 In Korea, Webtoons are just as known and accepted as people going to Youtube or Facebook. Pretty cool huh?? This is something probably 98% of us in the United States Comic Market have never heard of!!! I looked around at all the major comic blogs, webcomic places and not a peep about Webtoons anywhere. At first glance, like I mentioned, you’re going to see a lot of Manga looking stuff there. (actually in Korea it’s called Manhwa) — but it’s not that they only want that style, it just happens to be the most popular in the Asian market. And that’s exactly why they are over here with this contest, knocking on the USA comic market’s door…. they want ANYONE with ANY style amateur or pro, to upload their comics there and give it a shot. No strings attached. If you dig a little further, you’ll see there’s also a push to translate Korean comics into English, and vice versa, AND other languages as well. That potentially expands the readership of your comics by millions of people worldwide. That seems pretty awesome to me. Okay, I’m going to leave this as my first blog pertaining to LINE Webtoon, etc. I’m really excited to be involved in some way and help get the word out. I’d love to see BleedingCool.com or someone posting about this and you have my permission to quote me or use any of this as you’d like. Next time I’m gonna talk about the layout and usability and ease of use. And maybe how to use this to experiment with your sequential art. I know I am. I’ve posted a comic of my own just to go through the process myself and report on it in my next blog. In the meantime, the deadline for entries of any length is January 25th if you want to give it a go. I do see a few recognizable webcomics sneaking in there.